The Co-operative Houses of Elanthia (also known as CHE) is the formal organization to which the Great Houses belong. Its purpose is to establish a standard for behavior by the member houses. It is headed by Arch-Steward Lord Ruthiford Pennington. In 5115, Lord Ruthiford commissioned the building of Ebonstone Manor in Wehnimer's Landing to serve as organizational headquarters. It is located down a red-bricked pathway on North Ring Road one block west of Helden Hall. The emblem of the CHE, as elected by vote in 2006, is a circular knotwork of conjoined hands surrounding a formidable manor. Each of the Great Houses has its own grounds and provides various services to its members and, in many cases, to the adventuring community as a whole. Some commonly held events include service nights (spell ups, bounty help), games, lectures, and formal balls. 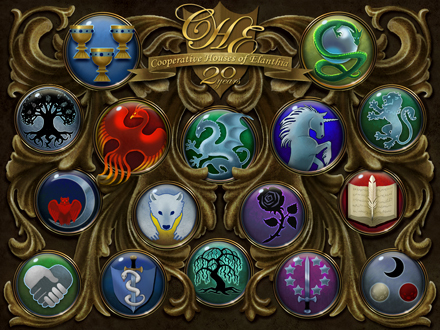 The events are organized by house officers, who are regular subscribing player characters given extra commands to deploy things like town criers, news items, and house tents, and who can request assistance from an overseeing GameMaster for things like raffle tables, structure additions, and extra event messaging. In addition, characters who join a house will have their locker(s) moved into the house structure and/or house annex, depending on the house, location, and subscription level of the account. In each city other than that where their grounds are located, each House is represented by a private room with locker access located in a public building, in many cases near the public lockers. Two examples of this are the Lost Home in Ta'Illistim and the upstairs of Hale Hall in Mist Harbor. Each House sets its own induction schedule, membership requirements and joining fees. F2P accounts may not join a House. Members can resign from their current House in the presence of a House clerk using the RESIGN command. Once resigned, you will no longer be a member of a House, and thus will no longer have the associated benefits (House access, increased locker size). There is no waiting period between leaving one House and joining another. This page was last modified on 23 March 2018, at 22:45.